The Atlas Mountains are the principal geographic feature of the North African countries of MOROCCO, ALGERIA, and TUNISIA. They are made up of six mountain ranges—the Anti-Atlas, the High Atlas, the Middle Atlas, the Saharan Atlas, the Tell Atlas, and the Aurés—with high plateaus and plains between them. The mountains run northeast from the Atlantic coast of Morocco to the Mediterranean coast of Tunisia for approximately 1,250 miles. The Atlas Mountains have had a profound effect on North Africa’s climate, economic resources, and human history. 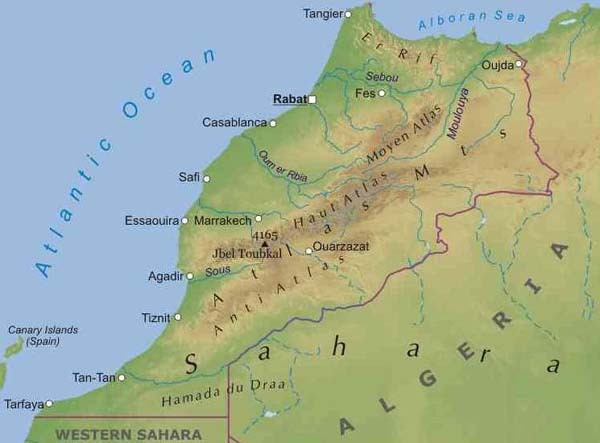 Separating the coastal lowlands from the SAHARA DESERT in the interior, the ranges prevent the desert heat from reaching the coast. They also trap moist winter storms that blow in from the Atlantic Ocean and Mediterranean Sea, which causes rainfall along the coast and prevents rain from reaching the interior. In addition, snowfall in the mountains feeds rivers and streams that water the northern parts of Morocco, Algeria, and Tunisia. For these reasons, the northern districts are greener and better suited to agriculture than the flat desert lands found elsewhere in North Africa, and over the centuries people have chosen to settle in these more fertile areas. The Atlas Mountains are home to several tribes of BERBERS,indigenous North African people. Because of their isolation in the Atlas Mountains, the Berbers have been able to maintain their languages and customs. Many of them support themselves by farming and raising livestock. The mountains’ name comes from the Greek mythical figure Atlas, who bore the world on his shoulders. The ancient Greeks believed that Atlas lived among the North African peaks. The Arabs who later settled in the region called the mountains Jazirat al-Maghrib, “island of the west,” because of their contrast to the surrounding desert. Today Morocco, Algeria, and Tunisia are sometimes called the MAGHREB or Maghrib.